Scipione, a typical New Yorker in the end. Chad A.Johnson hits a high note with the aid of his nurse. Scipione does not take the bait. Alden directs the chorus is unusual but apt ways. They delivered with charm and delightful toasts. It takes someone as great as Scipione to choose. 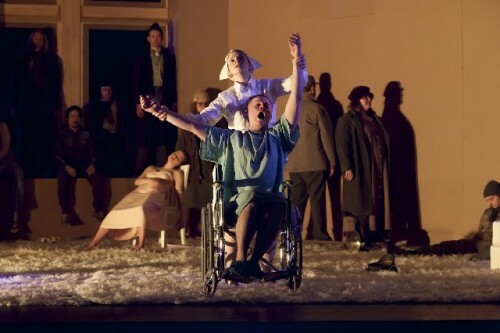 Ten years ago, Il Sogno di Scipione was one of the first productions of the fledgling Gotham Chamber Opera, today a thriving group committed to staging unfamiliar works in first-rate productions. They also tout up and coming works at Le Poisson Rouge. Sometimes their venues are novel, like a Planetarium. Earlier this year they premiered Nico Muhly's moving new opera Dark Sisters, which will be reprised by Opera Company of Philadelphia in June. Cicero laid the groundwork for Il Sogno as he concluded the sixth book of De re publica with Scipio’s dream. “Scipio, your grandfather, like myself, your father, cherish justice and that sacred observance of duty to your kind…Such a life is the way to heaven, and to this assembly of those who have already lived, and, released from the body, occupy the space which you now see before you." Mozart picked up Metastasio’s florid libretto based on the Cicero, and looked at Roman general Scipione after his defeat of Carthage, dreaming that he has a choice between fortune and constancy. He makes the politically correct choice. Mozart light is a delight in the Gotham's rendering. 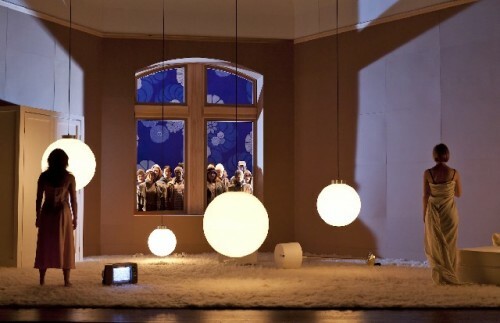 Christopher Alden, a wonderful regie theater creator, conceived Il Sogno in the present, placing the actors in a spare studio apartment with a window looking out into a vast and unusual universe, full of stars that look like a cross between snowflakes and blossoming flowers. Cicero noted “stars which could not be viewed from below, and these stars were vast, far beyond what we have ever imagined...The earth itself indeed looked to me so puny as to make me ashamed of our great empire, which was not more than a dot upon its surface.” General Scipio is quickly put in his place. In Gotham’s take, Michele Angelini as Scipione conveys his quandary with a touching swing between bravado and anxiety. While some debated the likelihood that a sixteen-year-old Mozart wrote this ‘cantata', and thought the author was Mozart pere, it is much more likely that this is the son's. Proportioned with care, paced with surety and full of insightful dramatic gestures, Il Sogno has the marks of a young master. Later Mozart would modify his demands on singers, but here the lines and decorations are almost impossible to deliver. To watch the Susannah Biller dazzle as Fortuna was jaw-dropping. She met extraordinary demands on her dramatic talents, while never dropping any of the more-notes-than-you-can-possibly-count. Sometimes playing with us in an over the top response to her own performance, she is an arresting actress-singer. Her competitor for Scipio's heart and mind is Marie-Eve Munger, who reached the highest notes Mozart ever composed with seeming ease, retaining a lovely pure tone which she established early on. Generations that preceded Scipione came to advise in aria and recitative. First Arthur Espiritu as Publio, spinning his advice on one-leg. Then Chad A.Johnson as Emilio, afflicted by palsy and the shakes, he somehow managed with a daunting cool to continue the back story for Scipione. Angelini was the dreamer, observing, questioning, and wondering. As he warmed through the evening, he displayed a particular talent for delivering pure and yet robust Mozart lines. Rachel Willis-Sorensen capped off the cantata with a glorious performance as Licenza. Ever playful, she sang with a rich evenness of tone that was entrancing. No one was surprised to learn that she has already made a debut at Covent Garden. While neither characters nor conflict develop, the ten arias, recitatives, and choruses were all sung beautifully, and enhanced by Christopher Alden's staging. Too bad that we don't see more regie productions here. Making the setting present and lively enables us to hear all the more clearly and deeply the music of past masters who we might dismiss as boring in a more conventional setting. In the Gotham Chamber Opera's presentation, all the creative zest, the melodic sparkle and the intuitive understanding of opera buffa conventions are on display. Neal Goren delivered from the pit. Cicero had written that “skilled men copying the harmony of the universe in string and voice, opened for themselves a way back to the heavens.” Gorem conducting showed us how. 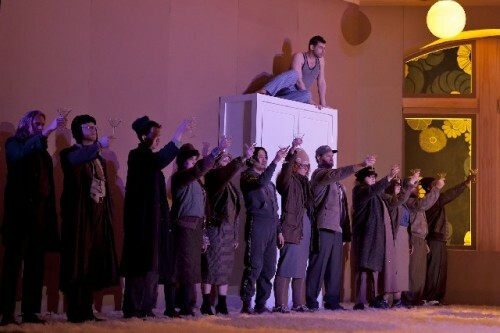 Taken on its own terms, Il Sogno is as much fun as Mozart’s later operas. Go and swoon as you listen and look.